Today at 8:30 AM I start my trip to India. I am on a Cosmos Tour. My first let is from MPLS to Detroit and then on to New York JFK. I have a 1.5 hour layover to catch a bit to eat. Then onto JFK At JFK I have a 4-hour layover for my Air India flight. At 8 PM We leave for the long flight over the Atlantic. I asked about my CD player and they said it was OK, I had no problem at all with Air India / Indian Air even though I had heard otherwise. I seem to have a habit of flying during clock changes so I actually get into Heathrow at 8 AM GMT +1 (summertime). We have a 2-hour layover and we must disembark the plane. I look around the Duty free for a while and then reboard the Air India 747-400 . We fly over Germany - Budapest - Istanbul - Tehran and south of Afghanistan. They show a varity of Indian Movies and some American movies as well. Our pilot calls out attention to the border between Pakistan and India, it is easy to see it is all lighted up I have never seen this before, of course they do have some major differences. Our flight lands at Delhi first and then onto Bombay After 2 days we will fly back to Delhi. This is too bad because we have to endure another layover while they clean the plane and change crews. We are all wore out, I have been traveling for about 30 Hours already. We are in the air for the 1.5-hour flight to Bombay. We have been feed well by Air India with a choice of Vegetarian and Non vegetarian foods. We finally land in Bombay at 2 AM. A fellow in the next row cannot find his tickets, he says he lost them on the plane. I think I saw them on the floor and they picked it up with the rest of the trash. 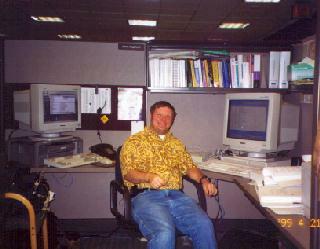 I find out later he Bob and he is on our tour and is my roommate he will go through hell getting these tickets replaced. After going through Immigration and customs we meet our tour guide who was on the same flight. We find our bus and after they get our luggage we are on the way to our Hotel the President Hotel. Even at 3 AM it is very hot out and we notice that there are millions of people sleeping on the sidewalks we are told that there is a 55% unemployment rate here and the millions of unskilled workers come to Bombay looking for work. We reach our hotel and make it to our rooms, it is 4 AM. After a little bit I get some sleep until 8:30 when we get up for some breakfast. Bob is my roommate and is am a American citizen but he lives in Canada and he is retired. I return to the room. Unfortunately Bob has had to go with a local Cosmos representative to Air India offices to get his tickets replaced. They send him to the police Department for a report first. After getting a report he goes back to Air India offices and has to fight the bureaucracy, without the help of the lady from Cosmos he may still be there, no one says it is possible, no they have no authority. At 2 PM we leave on our guided tour. Our local guide is a lady who is well dressed and well rehearse she is very knowledgeable. 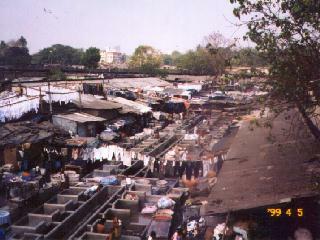 We stop by an outdoor laundry and then drive along the bay called the Queens necklace. Visit the Gateway Arch, Victoria Train Station, Jain Temple, and the Hanging Gardens. We return to the hotel at 5:30 and later most of us have dinner there. We have an interesting group of people, there are 16 of us. And there are no couples everyone is traveling single - some are married but left their spouse behind. We also have a few older people who have a hard time walking which is not good on this trip in that there is a lot of walking and the heat takes a toll on all of us. We also had 2 guys who paid for the trip and never cancelled or showed up. This morning most of us go on the optional tour to the Elephanta Caves. We take a slow boat from the Gateway of India Arch to the island from there it is a log walk on the peer and then a steep climb up 100 steps to the cave. 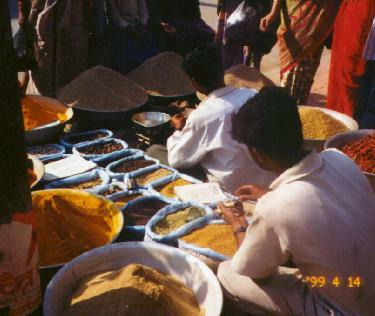 And we have to run by all of the hawkers selling their goods. The caves them self's have many Hindu carvings. After returning we go to the airport and our flight to Delhi. Bob has to make one more trip to Air India first and he does finally get his tickets. At the airport waiting for our flight to Delhi I get hungry and buy a chicken sandwich at a cafe there. This was a big mistake in that I was to get sick after this which I believe was due to the lettuce and tomatoes, which were washed in local water. It is hard to avoid these kinds of problems however I was the first to get sick however just about everyone else also got sick. When we reach Delhi we find our bus and go to the Park Hotel in the center of Delhi. 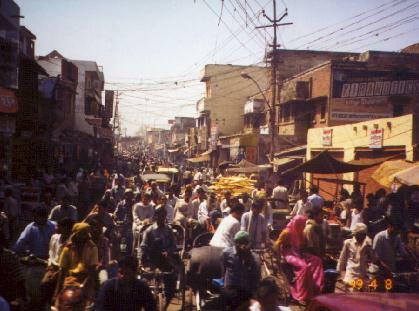 This morning we go on city tour, the old Delhi first. 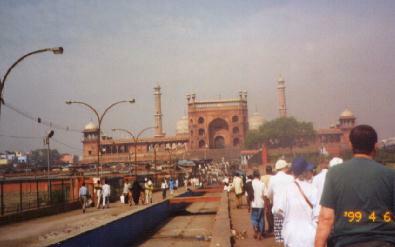 We visit the Jamma Masjid Mosque and the Red Fort. There is a lot of walking and it is Hot about 42C or 114F. Our tour guide Mark rents a rickshaw for us to ride between these 2 sites. After this we go by Raj Ghat which is full of protestors and then to Humayun Tomb which is also full of protestors. Evidently they are protesting some project north of Delhi that will dam a river and cause them to loose their land. Anyway there are many busses and there is no where to park, our driver lets us off and parks anyway, he will take the ticket - however the policeman beats him with a stick and causes him to leave. We visit the Tomb and find our bus. We visit Gandhi Memorial Museum where he was shot. We then drive by Parliament and finally back to our hotel. Our hotel is full of Americans in white robes, it turns out they are Sikhs and are here to celebrate the 300 year anniversary of their Religion. This morning we get up early to catch the Shatabdi Express to Agra. Our guide says we have several rolls in one coach. This turns out not to be true, we are spread out among 3 coaches and the seating chart at the station does not match the one on the train and my seat is taken, welcome to India. It is a 2-hour train ride to Agra but the train only stops for 5 minutes so we have to hurry to get off as others try to get on. We all made it. 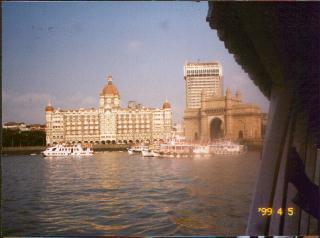 We take our coach to the hotel the Trident, very nice and then we visit the Red Fort. We return to the hotel and go out again at 4 PM when it is a little cooler. This time we go to the Taj Mahal. There are many hawkers here and we had one lady get her wallet snatched. 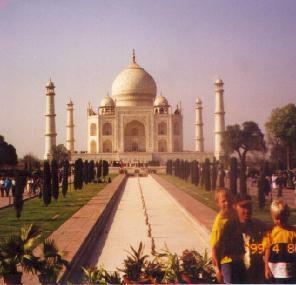 The Taj is beautiful and very impressive. We return to the hotel. I am feeling sicker. 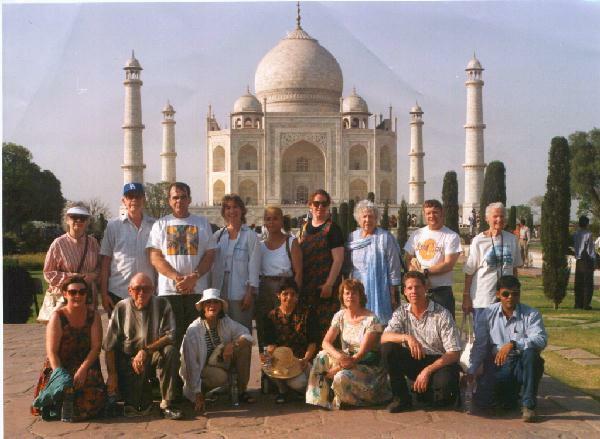 This morning several of us went to the Taj Mahal for sunrise, not my self I am still sick and resting. After they return we set out on our bus for Jaipur. We stop at Fatehpur Sikri abandoned city on the way. 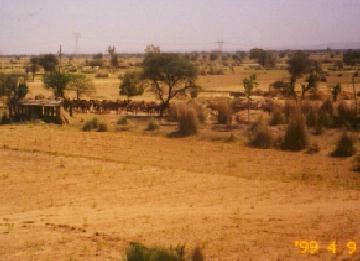 We pass many camels on the way and it is still very hot, many animals are in the shade or in the small ponds. We are in a semi desert area. We reach Jaipur the capital of Rajasthan at 6:30 PM. I skip dinner. Many others had dinner and got sick from it they believe. Our hotel the Mansingh Hotel is in the city where it is crowded. This morning like every morning we have a breakfast Buffet and this one is good. We are on a city tour and we start off visiting The City Palace and then the Hawa Mahal 17 Century observatory With its 90' Sundial the worlds largest. 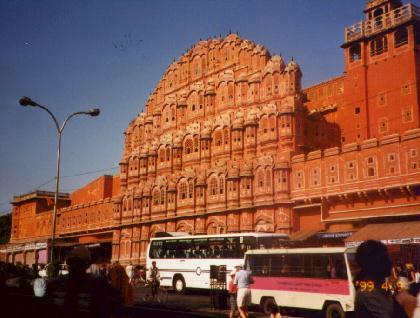 It is the pink city with the walls and buildings in a pinkish color. We stop at a pharmacy so I can get some Antibiotics however half the beats me there. I get some Ciprofloxacin which they sell over the counter, it does wonders. Returning to the hotel I crash. I do feel better this morning and I had a good breakfast. 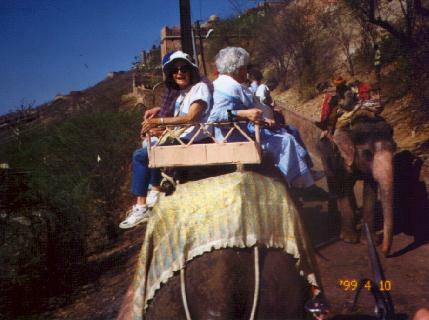 This morning most of us take the optional trip to the Amber fort and the Elephant ride to get there. It is early in the morning and it is not too hot so it was a pleasant ride. We visit the Fort and returning we stop at a carpet factory for a demonstration, and they just happen to have a store there. I do buy a Kashmir Rug. This morning we are off in our Bus for Delhi, we have to dodge many camel wagons on the way, and we see many overload trucks many of which tipped over. It is a long trip and we do make it to the Park Hotel again in Delhi. This is the end of the trip for some who did not buy the extension. I believe we lost 3 people. Those who leave had to get up a 3 AM for their flight -ouch It will be our turn later. 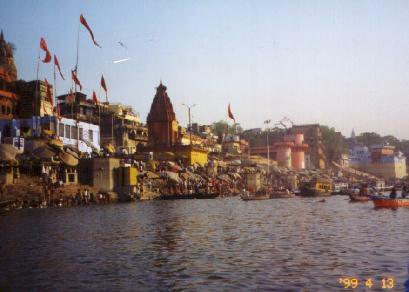 This morning we fly to Varanasi. When we arrive it is 45C or about 120F. It is decided to go to the Clark Hotel first and then later at 4 PM when it is cooler we will go on tour. Through out India at every hotel we experience power outages and it is no different here. I just hope I am not in an elevator when it happens. The phone system if you call it that consists of 2 outgoing pulse dial lines. At 4 PM we set out and visit Sarnath the birthplace of Buddhism. We also visit Bharat Temple which houses a large relief map of India carved out of marble. 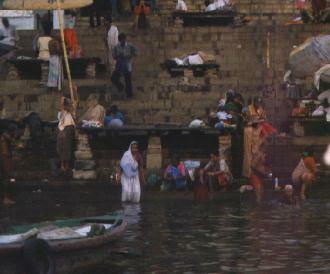 This morning we get on the bus at 5 AM to go to the Ganges. We have to walk several blocks to get there and we experience The street scenes getting there. We get on a boat for an hour ride to experience sunrise over the Ganges. We watch people bath, Worship, and be cremated. 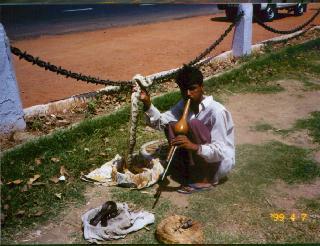 It was everything I thought it would be, this to me is India in a nutshell - it was awesome. We return to the hotel for breakfast and then we take our bus to the airport and our flight to Kathmandu Nepal. Our Indian Air flight is slightly delayed but we finally leave for Kathmandu. We have to go through Immigration and we had some people who did not have a visa so it took them longer. We find our bus and head for the Malla Hotel. It has been a long day but some go out and shop. Latter there is folk show at the hotel and the food was much better than the entertainment. 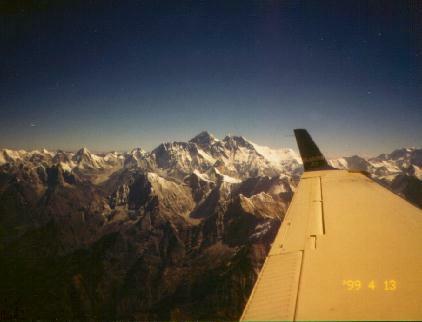 This morning I signed up for the optional Himalayan flight. I had tried to take this flight last year but it was cancelled because of weather. Today it was perfect weather and the flight was spectacular that's all I can say. After we return we went on a tour to Patan and later Durbar Square in Kathmandu which involved a lot of walking again. This evening I take bob to my favorite restaurant in Kathmandu and we have wonderful Indian food there. We also did a little shopping. We are headed for the mountain resort of Dhulikhel but first we visit Bhadgaon and the many temples there. 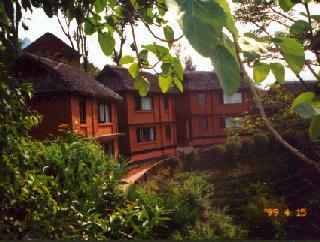 Then forward to Dhulikhel Mountain Resort. It is very nice here although you can not see the Himalayans because of the fog. It is cooler and actually quit pleasant. At 10 AM we get on our bus and go back to Kathmandu Airport and our flight to Delhi. I was in Nepal 6 months ago and I can see some differences already, the are building roads, sewers, rebuilding the Airport. Nepal is one of the poorer countries of the world but they are making progress. It is not a long flight to Delhi and we check back into the Park hotel one more time. At 3 AM we get up and start our long trip home. We have to be at the airport 3 hours ahead of time to be sure we have a seat. It is a long flight to London and our flight is delayed, It is bad enough being cooped up in an airplane but worst if it is on the ground. Finally we leave, the scenery out the window is very Interesting, we pass south of the capathian Sea and also the Black Sea. After we reach London we have a 2-hour layover again while they change crews. In the air again we are 3 hours late, some of us will miss our connections. I have a 5 hour layover so it does not matter much. They make up an hour over the Atlantic however. After reaching JFK and getting through Immigration and Customs the wait is not too bad for my TWA flight to St Louis. There I have a short layover and I continue to Minneapolis and I get there right at midnight. And 8 AM I am back to work. I really have no idea what time my body thinks it is it will take a week to figure out / readjust.